Many of our landholders and readers of this blog send us photographs of birds to identify, or animals that they are pleased to see on their properties and in their gardens. Last week, Robyn Patton, who lives south of Bendigo sent us photos of a bird that is ‘tiny and finch-like in size’. The little creature had collided with a glass window and passed out from concussion. Robyn put the tiny bird in her dressing gown pocket. Cradled in gentle, loving hands. The bird started to revive after a few hours, so she carefully placed the bird in a covered cat carrier. When the bird could perch well and seemed to be revived, Robyn set the little one free into the garden. Have you guessed the species? It is a Striated Pardalote! We featured these stunning birds on a blog last year with Peter Turner’s wonderful photos ( see here). 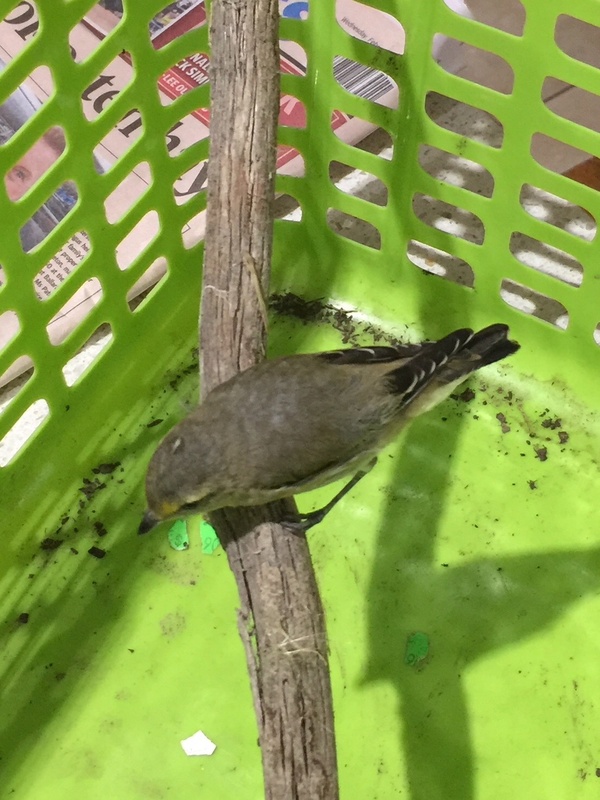 This rescued bird is very young, as it lacks the dark head and bold markings of adult pardalotes. My guess is that the little one had just left the nesting hollow, and unfortunately encountered a window on its first day! 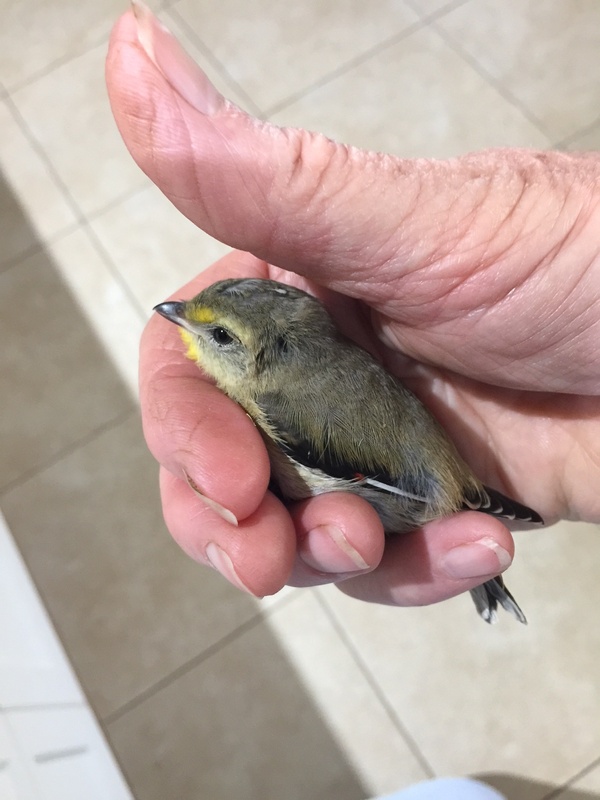 Robyn’s quick thinking saved the pardalote from being eaten by an animal while unconscious. We suggest that a concussed bird be placed in a covered box such as a shoebox, with a tea towel or something soft in the bottom, and then left in a quiet room for a few hours to recover. The dressing gown pocket is very comfy, but a shoebox is an even quieter, safer spot for the bird to recover. The bird will not need water or food, just warmth, darkness and quiet. If it is still very ill, you may need to contact your local vet or wildlife shelter. 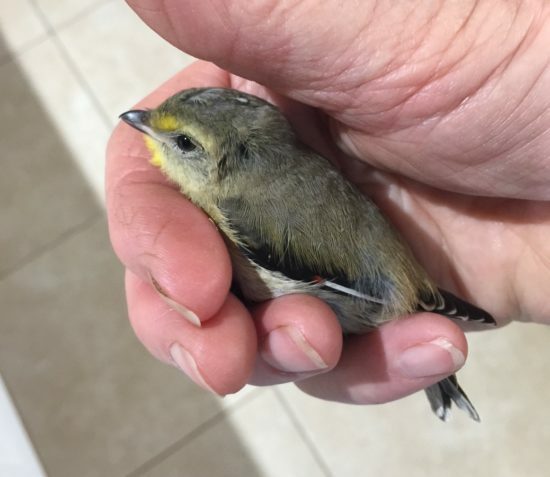 Thanks for sending in the photos, Robyn – and we are thrilled this little bird recovered! For information on how to prevent birds colliding with windows, please see the excellent link below.